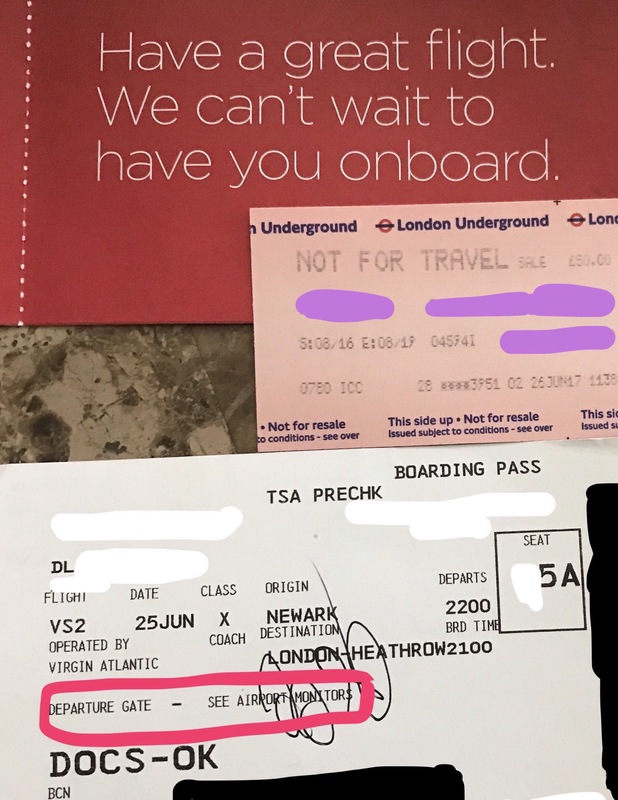 When we arrived to EWR, the Virgin Atlantic representative at the desk was super helpful and changed our seats to better ones. Out of curiosity, I asked what the upgrade to Premium Economy would be, she said $300 per passenger. I explained that we had tried to upgrade using points several times, however all attempts failed with them and Delta. you can forget that you at the Newark airport. As one can expect it was crowded during the 30 minutes we were there. The fact that it’s before security makes this location tricky. One would probably find more use if there were no concerns about long security lines, etc. TSA managed to get us through fairly quickly considering the growing line. The waiting area was super crowded as well. We were able to sit at the adjacent gate. VS boarding process is similar to JetBlue’s, but messier. The flight did not take off on time due to “technical issues” they were trying to resolve. You never want to hear that kind of language while on a plane, but we did manage to leave and get to London as planned. The meal we were served was better than anything one is likely to get in domestic business in any US airline. The service was excellent, I certainly did not feel like a bag of meat being taken from point A to point B on this flight. The seats are similar to domestic premium economy, but I did wish I had flown Upperclass (using miles of course!). Yet, the 7.05 hours on the air were not as bad as I had feared. When we got to LHR, it took us about an hour to go through immigration. The immigration officer who from afar looked a bit mean, turned out to be a kind soul who welcomed us to England warmly. I had planned on taking a ride sharing service to our hotel, but our child insisted on getting there via the London Tube. One of the friendly and professional Tube staff suggested we get an Oyster card and put 20 Pounds (£) on it since we were going to be in London for 2 days. The total was 50 pounds, but as the rep explained we could get a refund on all unused funds and the $5 deposited for each card. We later found out that the amount must be under £10. We made it to the hotel in under 40 minutes, the cost was about £1.40. Looking back, the Tube is hands down the best way to get around London. This city makes the lives of tourists super easy. The only exception would be the way street names can be difficult to find at times. At least, for those of us coming from America. The Nadler hotel is located about a block from Earl’s Court and we had no issues getting there quickly. We already covered our fantastic 48 hours in Majestic London.